Join conversations tailored to senior leaders that dive into your strategic challenges. 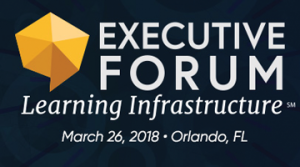 Share perspectives and ideas with your peers, and have your learning infrastructure questions addressed by industry experts at the Executive Forum. The Executive Forum on Learning Infrastructure is an elite event for senior L&D leaders that consists of a one-day experience prior to Learning Solutions Conference & Expo, plus the opportunity to continue the connections and conversations through exclusive learning opportunities at Learning Solutions. It is an opportunity to connect with other leaders as you explore how individual and organizational learning and performance can be enhanced through a combination of strategies. The Executive Forum is your opportunity to collaborate with industry experts and other senior learning leaders as you look to expand your strategic perspectives to further engage and connect with your organization. The conversations don’t end at the close of the Forum. Executive Forum attendees also have access to an exclusive Lounge throughout Learning Solutions Conference & Expo. It’s your space to continue the connections and conversations that started at the Forum, or to take a break to grab a cup of coffee or to catch up on emails. We’ll also be hosting a special lunch in the lounge on Tuesday and Wednesday exclusively for Forum attendees so you have a dedicated opportunity to continue the conversations with your peers. Join us in examining the impact of learning and performance strategies on your organization and collaborate with other senior learning leaders exploring the growing interest in the strategies, methodologies, and technologies that are transforming how organizations approach supporting their workforces. Have questions about the forum? Please feel free to reach out to David Kelly directly. If you also register for Learning Solutions, you’ll receive a $300 savings and exclusive benefits during the conference.